Apple today started construction on a new warehouse in downtown Reno, Nevada, with the site visited this afternoon by Apple CEO Tim Cook, Nevada Governor Brian Sandoval, and Reno Mayor Hillary Schieve, reports the Reno Gazette-Journal. In a speech given at the groundbreaking of the warehouse, which is located near the company's Reno data center, Cook said the data center is a key component in the ecosystem that provides billions of iMessages, photos, and FaceTime calls to customers around the world each day. "We've invested $1.6 billion in the region today and over the course of the next six years, we intend to invest an additional $1 billion," said Cook. "Reno plays an incredibly important role in the products and services that we provide our customers worldwide. Without the data center here, none of this would be possible." Apple's presence in Reno kicked off in 2012 with the construction of its data center. As part of that deal Apple was required to build a facility in the downtown Reno tourism improvement district, hence the warehouse. Apple plans to use the upcoming Reno, Nevada warehouse to move equipment to the data center, which Apple allowed the Reno Gazette-Journal to tour today following Cook's speech. 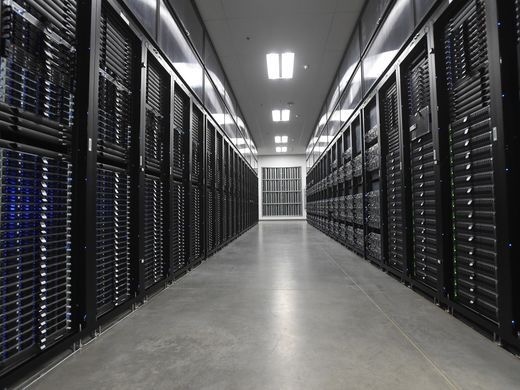 The site shared nearly 50 photos captured from inside the data center, filled with racks and racks of the servers that power Apple services. The images provide glimpses at Apple's server setup, cabling, cooling operations, cleaning rooms, and more. Because nothing says downtown tourism like a warehouse for a data center. A data center in the hottest state in America? Great news for air conditioning suppliers. Much easier to cool a hot and dry climate compared to a hot and humid climate like Texas or Florida. Plus Reno is at an elevation of 4500 feet, so it's not as hot as you think. Lots of sun for solar panels. It's a great location. Racks and racks of Mac servers? Yup, it’s a data center. Great to see US investments. Next up, moving away from AWS and hosting their own iCloud services. Good to see the economy moving in the right direction. It's about 50 degrees here today during the warmest part of the day. Reno is not at all like Las Vegas. I am looking out my window at a 10,700' mountain in Reno. Why isn't Tim back at HQ helping the rest of the team dig itself out of the security holes they've made for themselves recently in MacOS!? Because that's SVP Craig Federighi's domain. You may not know that CEOs generally have people below them who are far more qualified to understand, tackle, direct, and solve engineering issues that arise from time to time. I think you're confusing Las Vegas and Reno. While it does get hot in Reno in the summer too, it's nothing crazy.